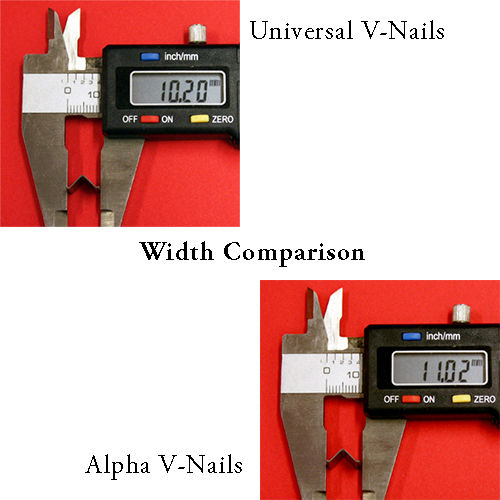 Universal Stick V-nails have a width of 10.2 mm. They are used in the Inmes IM-3P, IM-4P and IM-5P and in our FS 1000 and FS 2000 underpinners. Cartridge V-nails are v-nails enclosed in a plastic cartridge for use in specific underpinners. Inmes IM-2 underpinners use this type of v-nail. V-nails come in both softwood and hardwood types. The type of molding material you are using will determine which type of v-nail you should use. Softwoods such as poplar, pine and cedar generally have a more open grain and require a sharper v-nail to join the molding. You would also use softwood v-nails for plastic/polystyrene frame molding. Hardwoods such as oak, ash, hickory, cherry, maple and walnut have a tighter grain and require a more blunt v-nail to join the molding. You would also use hardwood v-nails for moldings made from MDF. Using the incorrect type of v-nail for the material you are joining could result in split molding. V-nails also come in different sizes; 5mm, 7mm, 10mm, 12mm and 15mm. The corresponding sizes in imperial measurements are 3/16", 1/4", 3/8", 1/2" and 5/8". 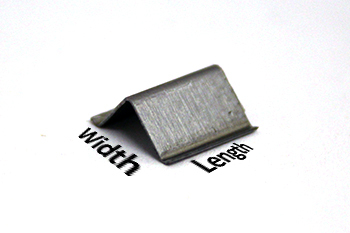 This size refers to the length of the v-nail, not the width. Use the depth of your molding to determine which size v-nail you should use. Ideally, v-nails should cover about 70% of the depth of your molding.